A couple of stunning admissions on the Iranian nuclear sellout in the Senate Foreign Affairs Committee on Wednesday from Martin Dempsey, Chairman of the Joint Chiefs of Staff. President Obama’s claim that Congress must either back his deal with Iran or plan for war does not square with the advice he has received from his top general, Senate lawmakers learned on Wednesday. Dempsey also acknowledged that he advised the president not to agree to the lifting of sanctions pertaining to Iran’s ballistic missile program and other arms. “Yes, and I used the phrase ‘as long as possible’ and then that was the point at which the negotiation continued — but yes, that was my military advice,” he told Senator Kelly Ayotte (R., N.H.). In the event the new deal goes into effect, the arms embargoes will expire over the next several years. Citing chapter and verse of the deal, Ayotte pointed out that the “plain language” of the bargain requires the United States “to help strengthen Iran’s ability to protect against sabotage of its nuclear program” — even to the point of warning Iran if Israel tries to launch cyberattacks against the program. Dempsey seemed caught off guard when asked about that provision. “I hadn’t thought about that, senator, and I would like to have the opportunity to do so,” he told Ayotte. That exchange came shortly after Dempsey and other administration officials acknowledged a concern that Iran could launch cyberattacks against the United States and even the International Atomic Energy Agency, which is tasked with key oversight of the Islamic Republic’s nuclear program under terms of the deal. when asked about that provision. “I hadn’t thought about that, senator, and I would like to have the opportunity to do so,” he told Ayotte. 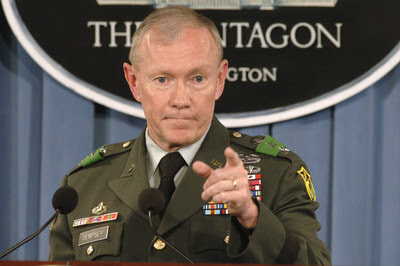 This a scary response coming from the general that advises president Obama. It doesn't engender a lot of confidence in his thinking skills. Does he think Iran is Iowa?